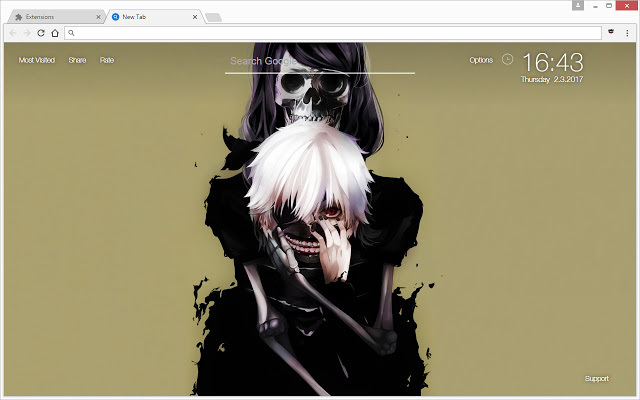 There are several anime wallpapers and themes inspired in Tokyo Ghoul for your Chrome. The images include heroes and villains from different arcs of the story. Some of the most incredible themes are centered in the main protagonist of the series: Ken Kaneki, and his female companion, Touka Kirishima. However, there are hundreds of themes depicting battles from the series and secondary characters such as Renji Yomo, Yoshimura and Nishiki Nishio. As the anime series of Tokyo Ghoul are full of blood and fights, it is not recommended as a theme for web browsers used regularly by kids. If you are going to choose a theme of Tokyo Ghoul, be careful to select one of the less violent and bloody. The series has become very famous because of the level of violence and blood, but it is also a series about courage and love. The romantic themes inspired in the anime series depict Kaneki and Touka, but there are also other non-canon couples. Behind the creation of Chrome themes, anime fans can imagine their favorite couples even if they have not been together in the series. 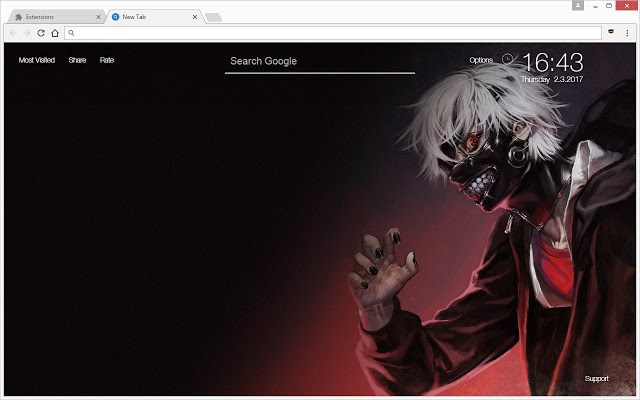 You can give your own web browser a different look by choosing among the vast selection of Google Chrome Tokyo Ghoul themes we have selected for you. Do not forget to avoid little ones for looking at the most violent ones. This entry was posted in Anime and tagged anime, Google Chrome, themes by Juan Martínez (Google+). Bookmark the permalink.